We’re still plugging away at the little details in our new home over here. We got a huge chunk of our home finished within the first few weeks, but it’s those little details that finish the space that take so much time and thought, and are really slowing us down! One of the things we struggled with the very most was lighting. It’s such a huge part of any space, and we wanted pieces that meshed with our decor, but were also functional and practical. We ended up doing ceiling fans in every bedroom, my office, the living room, and the outdoor room since we now live inland and the weather will get very hot during the summer. I assume that choosing ceiling fans would be an easy task, but the various factors and decisions for each fan made it a little tricky. 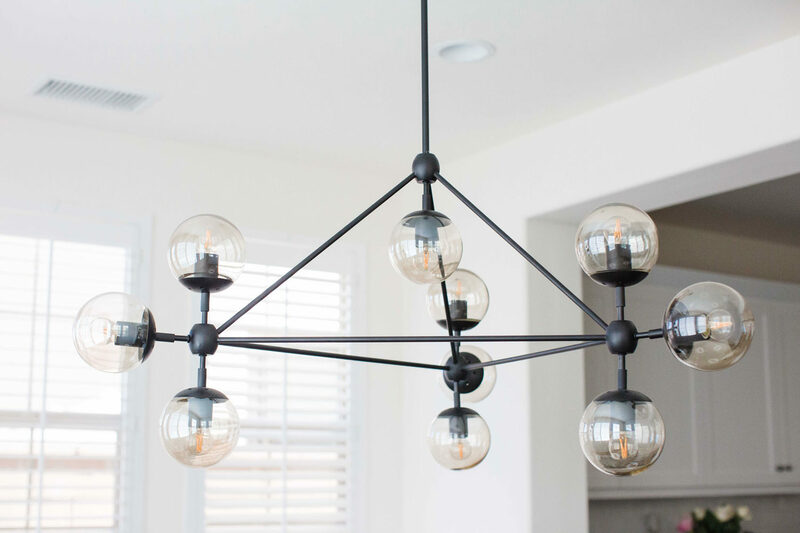 So we teamed up with Lamp’s Plus to help us find some functional, beautiful, practical fans for each of the rooms, plus a great statement chandelier for above the kitchen table. Requirements: Large enough to fit the big great room space, no attached light since we have recessed can lights, attractive but subtle. What we got: This metal blade fan from Lamp’s Plus was exactly what we were looking for. Its industrial feel makes it sleek and pretty, but not a point of focus. The total “wingspan” (if that’s a fan thing…) is 60″ long, so it’s really big and feels very substantial on the ceiling. I didn’t know I could love a ceiling fan, but I love this one so much. Requirements: Simple, attractive, built in light fixture, not too big. 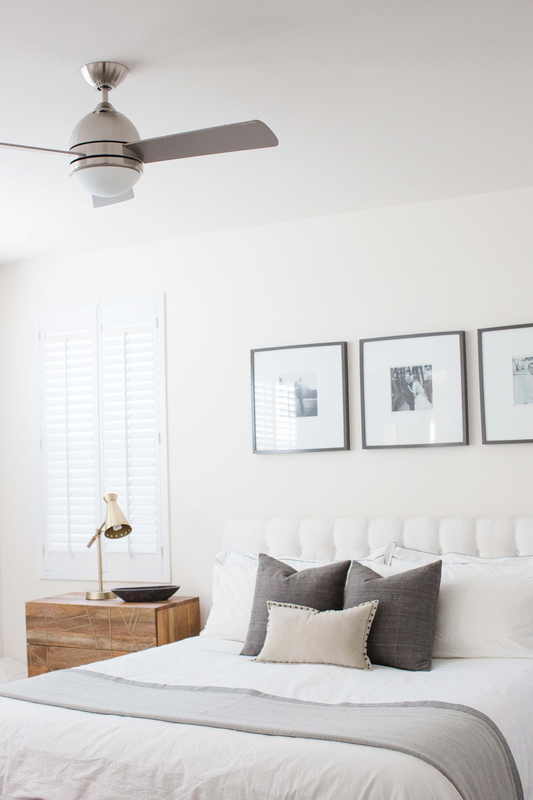 What we got: We ended up choosing these 44″ brushed nickel fans from Lamps Plus. They’re a huge step up from the standard white fan with the built in lampshade fixtures that most bedrooms have. 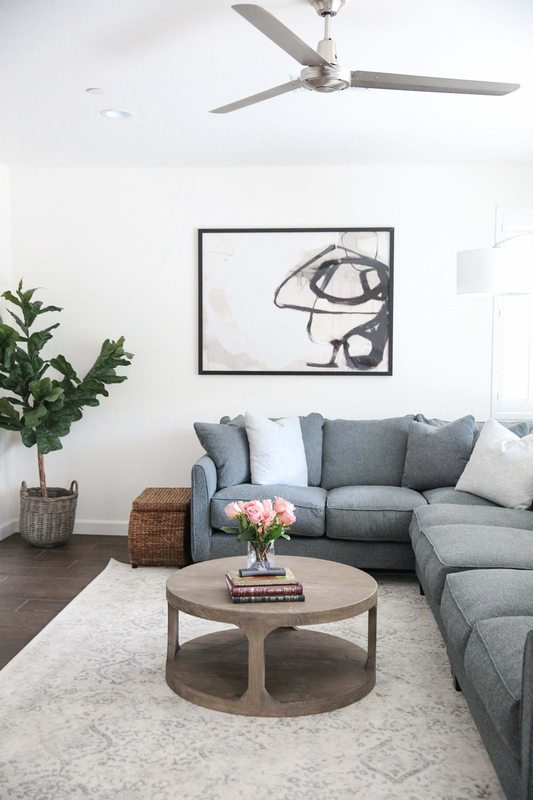 The color gives it a sleek and attractive feel that meshes with the rest of the house and the hardware all around our home, and although they’re small, they cool the room down very well. Requirements: Sturdy, large, built in light, outdoor feel. 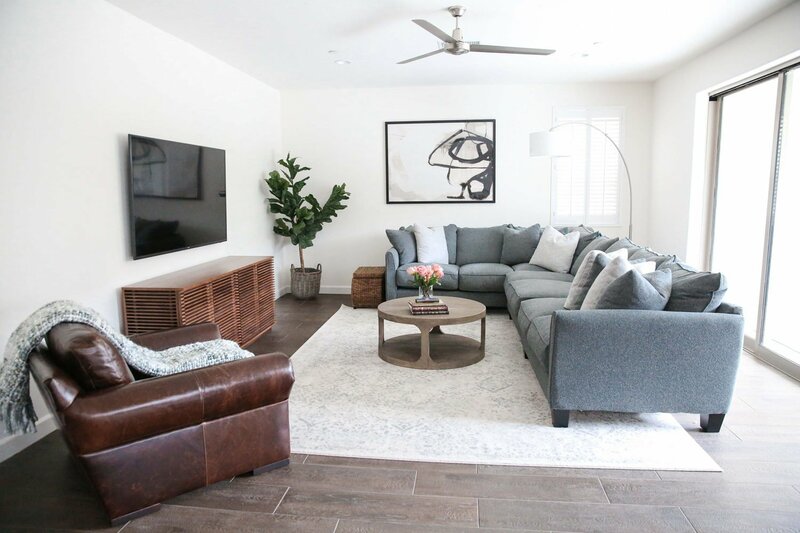 What we got: Most ceiling fans feel more indoor-ish, but this bronze 60″ fan –although it’s an indoor fan — feels very outdoor appropriate. 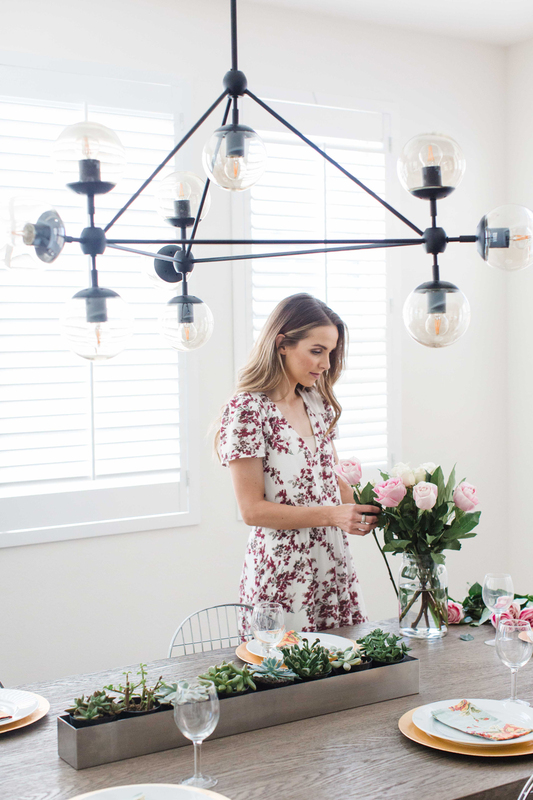 The bronze color gives it that sturdy, outdoor feel, and I love that it has a very subtle built in light so get a little extra light in the outdoor room when we’re sitting out there at night. It also has a 60″ length, so it fills the space really nicely. What we got. We deliberated over this decision for weeks. Chandeliers are HARD. But Lamps Plus had an incredible selection, and on their site we were able to narrow our search significantly which helped a ton. We mostly looked through the “Industrial Chandeliers,” which made our search much easier. 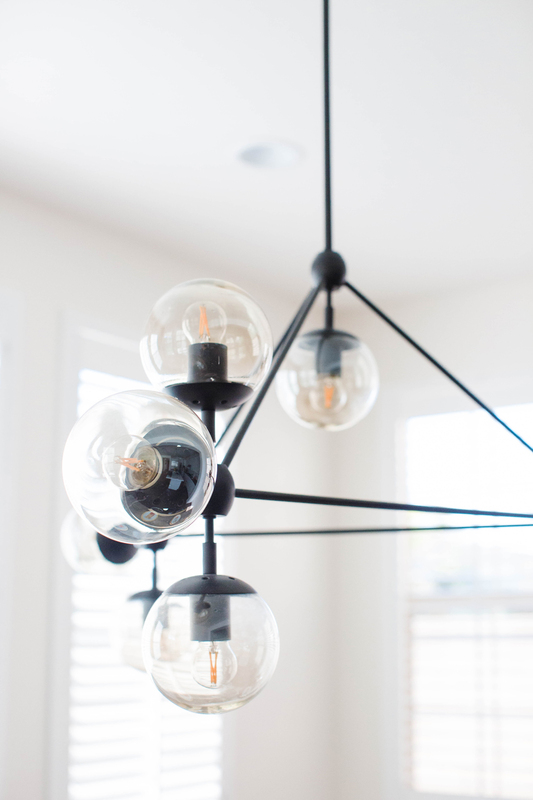 We ended up getting this gorgeous 40″ black globe chandelier. It’s simple and pretty, and it makes a statement without looking like it’s trying too hard. Determine your style and stick with it for all the fixtures throughout your home. Don’t do modern in some rooms, traditional in another, shabby chic in another. If you stick to one style, no matter what the fixture is, your house will feel cohesive. Size matters. Measure, measure, measure. A too-small fixture in a large room will draw negative attention. So pay attention to widths and heights. Check out Lamps Plus for the biggest selection of gorgeous fixtures! Everything looks wonderful! Beautiful home you have! So cozy and warm home! Everything is touched with flair! Where did you get the succulent holder in the middle of your table? Love! What paint color/brand did you use in your home? It’s beautiful! I’d love to see a post about how you’ve picked out your home’s color palette. WHERE ARE YOUR DINING CHAIRS FROM?? ?